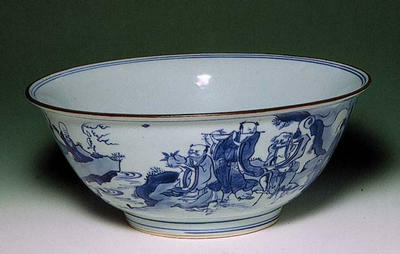 Large bowl of porcelain. Made in China. Reign of Kangxi. Anon. ; his sale, Sotheby�s, 18 February 1947, lot 96, purchased by Frank Partridge & Sons for Sir William Burrell, �30; by whom gifted to the Corporation of the City of Glasgow, 1947. Sotheby & Co., 18 February 1947, Catalogue of Chinese ceramics and works of art. Property of Russell Beverley, Esq., and others. Lot 96. Frank Partridge & Sons Ltd., Sale Book 15/35, stock no. 36853. Auction house, Sotheby & Co.